One of the least bemoaned results of Walt Disney Imagineering’s wars against all things not “Story” is the overall Presentationalist aesthetic – that mode of design which forgoes convincing, unified places and times for the straight, linear, didactic shot into information and conceptualization. Individual elements are sometimes mourned – EPCOT Center’s Future World pavilions chief amongst them – but nobody seems to reserve much love for Tomorrowland in its “white period”. Yet I think of all elements removed wholesale from The Magic Kingdom, the loss of all the character from that portion of both parks ranks as the most damaging. Tomorrowland balanced and reinforced the rest of the Disney lands, and the park is now a scale tilted too far off balance to ever fully recover. The future has always been remade. In the 1960’s, Disney did the chief sensible thing and had the 1955 Tomorrowland removed entirely to make way for the 1967 model. 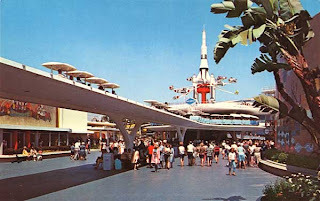 This version of Tomorrowland probably got the formula the “most right” of them all: the movement of the spinning Rocket Jets attraction to the top of the Peoplemover platform created perhaps one of Disney’s most recognizable architectural features, giving the land interest and form. Those little pastel Peoplemovers dashing this way and that, the monorail, the Matterhorn bobsleds, Rolly Crump’s rising stage, the spinning Carousel of Progress and more spoke of a hub of energy, interaction, the “World on Move” Disney wanted. Many of the key features were already in place: a dark ride inside a commercial, a circle-vision film, a simulated moon flight in a theatre with vibrating seats. 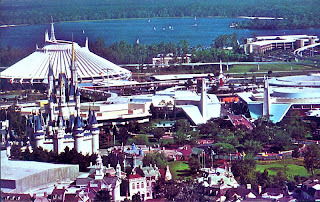 When Disney would add Space Mountain to this mix in 1977, the energy of the place would be nearly uncontainable. The Florida version added scope and size. Those little triangular ridges atop the buildings housing America the Beautiful and Adventure thru Inner Space became enormous spires fighting the castle for attention; whereas Anaheim had little fountains outside the entrance to the land, Orlando’s spires would spurt water straight down into the castle moat while water cascaded down the sloped walls to the left and right; a true torrent unmatched by any other Disney structure ever devised. Inside, the symmetry of the Disneyland version become even more pronounced, each building on the main pedestrian corridor becoming a terraced, glass enclosed, buttressed expression of modernism (fans of California Googie unfamiliar with this version would do well to study it). 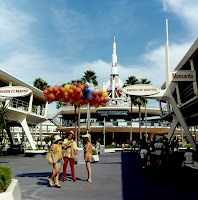 Claims about this “white Tomorrowland” often ignore the fact that, even in those early days, the area was overflowing with pastel yellows, oranges, blues and pinks. In later years the subtle palette would be cheapened to bright whites, blues and reds, but at least this earlier paint scheme was perhaps the best affirmation of John Hench’s claim that he had something like 70 versions of “white” in his paint palette. Nor was the land totally monochromatic; in full evidence were bright reds and blues inside Space Mountain and on the Star Jets, black and yellow and white inside If You Had Wings, green and black on the Grand Prix, and astonishing yellows, oranges, reds and browns inside the Tomorowland Terrace. Once the area was fully built up with its own Carousel of Progress, Space Mountain, a less meandering but more advanced Peoplemover and more, it was distinctly related but very different from the Disneyland sibling. What these future worlds were all about was variety. While much of the rest of The Magic Kingdom, for example, was lit by ornate lanterns and sconces, Tomorrowland was ablaze with bright halogens, neons, and incandescents casting variations on white too carefully planned to be ugly. The Tavern Singers and J.P. and the Silver Stars offered area/period correct music elsewhere in the Magic Kingdom, but at the Tomorowland Terrace, the modern and tastefully suspect Kids of the Kingdom offered show tunes and red polyester. In later years, the fascinating Michael Iceberg held court here in his fog-spewing electric organ shaped like a pyramid. In Anaheim especially, youth held court in Tomorrowland with dancing and nighttime festivities, while adults were more likely to be found over in the Blue Bayou or Tahitian Terrace. Tomorrowland was a fully developed deviation from something like Frontierland or Adventureland and their fantasies nostalgic. Without the 1971 Tomorowland, for example, the east side of the 1971 Fantasyland makes no sense, gradually becoming more austere and angular around the Mr. Toad area in comparison to the rich Germanic atmosphere of the Skyway area. The loss of this variation makes the overall “palette” of Disneyland and The Magic Kingdom less rewarding. The 1994 Tomorrowland is really an effort to bring the area in line with the rest of the park’s aesthetic mode, to tame the wild aesthetic departure into a homogenous sameness. Whereas once the playful nostalgic was the sole domain of the West Side of the park, now Tomorrowland would be remade as nostalgic futurism, a la 30’s pulp. This concept is much better of paper than it is in actuality for, much how EPCOT Center is today filled with distracting junk, this makeover essentially involved putting shells over all the existing infrastructure. Those massive water-spewing towers were demolished and, in their place, jutting rocks arrived – and not cool, futuristic, Fortress-of-Solitude type rocks, but more like Big Thunder Mountain Wished Upon Futuresville Rocks. The two most obviously dated shows – Mission to Mars and the Circlevision film – were replaced with “edgy” attractions like the ambitious Timekeeper and witless Alien Encounter. 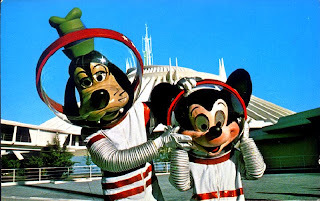 The WEDway People Mover became the Tomorrowland Transit Authority, evicting the harmless if unremarkable ORAC-1 with shouted announcements and other nonsense. Sky-reaching palms, added to reinforce the angular nature of the Tomorrowland 1971’s structures, were replaced with bland shrubs and flat-leaf plants. Anything not made metallic was painted purple or blue. It all amounts to a lot of work that doesn’t enhance what was there to begin with. There are some whimsical touches that are too little, too late, such as a phone of the future, a robotic newsboy and some clever parodies of local organizations which were, still, done better at Disneyland’s Toontown. There’s nothing wrong with the ideas present, but in execution they are too often straddled with low budgets and unreasonable expectations. Disneyland’s Tomorrowland met with an even less enviable fate for at least Orlando was permitted to retain its’ Peoplemover, Astro Jets, and for several years Skyway. Bad decisions compounded on bad decisions in California and, among other changes seemingly calculated to remove the “local color”, the spinning attraction was moved to ground level and tacked onto the hub of Disneyland, the Peoplemover was replaced with an unreliable speed rocket attraction which destroyed the original open air track in the process of zipping around Tomorrowland, and the Skyway was long gone. Crump’s rising stage became a sign for the food court which it anchored. All of the life was sapped from the place. The question then becomes what the role of Tomorrowland is in the Disney patheon. If Imagineering will no longer tolerate the Presentational mode, and if Tomorrowland must have a “story” and exist harmoniously with the other themed areas of the castle parks, perhaps Disneyland Paris had the best idea with their Verne-themed Discoveryland. Orlando’s pulp writing theme is promising, even if it needs less Buck Rogers and more Fritz Lang in its DNA and a lot more work and money after its abortive first try. Anaheim’s gold-hued Tomorrowland has already been vanquished in favor of that “old”, “white” version, but there is still no real life to the space. Both areas are in a transitional mode right now, and either need to be allowed to be what they are designed to be or rethought and reworked even more than they are now. Space Mountain, one of Disney’s most viable franchises, seems to have doomed Tomorrowland to existence, and the inclusion of Star Tours and Buzz Lightyear’s Astro Blasters seem to be the most viable opportunities to continue to resuscitate the land. But I ask: why? Hong Kong Disneyland’s flaccid, flat, vacant Tomorrowland is window dressing to their version of Space Mountain, so if the inclusion of a whole area to validate the existence of a single thrill ride is deemed important to the essential makeup of the park, then the solution is to reinvent Space Mountain so it doesn’t have to inhabit a Tommorowland area and axe Tomorowland from all future designs entirely. Disney seems uncomfortable with futurism these days, and real forward-thinking futurism died in mainstream culture around the time of Walt Disney’s passing. What Tomorrowland really is doomed to be today is camp, in the true, almost lost meaning of the term: the elevation of unimportant things to places of undue prominence. The 1994 Tomorrowland is awash in irony, where the spectator is encouraged to perceive something like a robotic newsboy as a relic of an outdated era and its’ idea of what the future will be. The existence of such a “futuristic” but simultaneously obsolete figure creates a distance where the spectator is superior to but still celebratory of the object in question; it becomes camp. This isn’t a future that’s relevant to us today, which is the joke, and the “modern”, “cutting edge” Alien Encounter, with its’ attitude and jaded horror film vibe is what we were meant to see as the “dark heart” of that Tomorrowland, where there’s no beautiful tomorrow on the horizon. This concept was antithetical to the rest of the Magic Kingdom, and now that Timekeeper, Alien Encounter, and much of that Tomorrowland’s ancillary themeing (remember when there were walk around alien face characters and rollerblading custodians??) is gone, the area – and the Tomorrowland concept - is waiting for its’ future to arrive. It is my genuine, firm belief that if all one ever does is to expose herself to culture that is culture approved of by Disney, then her world view will be far narrower than any shared by any of the artists who created the Disney product from the great eras. Disney isn't high culture, but it isn't low culture either, and as such I genuinely hope to point the receptive spectator in the direction of related but challenging, exciting art which will significantly broaden the richness of the experience Disney offers. Walt Disney often sought in his life and work to associate himself with other notable figures of American history - other movie moguls, oftentimes immigrants, aligned their product with the great international masters such as homespun Warner Brothers offering England's Bard in our last For Further Study - Disney sought and found success in America by creating works of undeniable local color. His early films have been often described as "Barnstorming" - as much for their irrepressible energy as their rural Midwest atmosphere and unsophisticated humor. His one big effort to recruit "Continental" sophistication - Fantasia - mired an already troubled studio in even more financial doubt. It was not an experiment Disney would repeat. His bread and butter for the next several years would draw heavily on American pop rather than the European Gothic of Snow White and Pinocchio. Disneyland, Walt Disney's largest manifestation of American mythology, included a "River of America", essentially a fantasy of the Mississippi in miniature, a big sternwheel riverboat called the Mark Twain, a whole attraction called Tom Sawyer Island based much on "recieved knowledge" about Sam Clemens' most popular book, and would eventually expand to include a whole New Orleans section, a miniature great northwest, monument valley, and more. Walt Disney World's version of American history tied together by that river was overall perhaps a bit more ambitious, and in the intervening sixteen years of additions and reconceptualizations the threads of the fictions of Sam Clemens, Walt Disney, larger American myths and WED enterprises had become tangled so finely that extracting any one element from the others would be almost impossible. 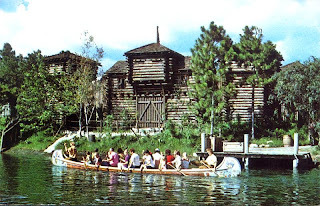 Mike Fink's Keel Boats, based on a historical figure appearing in Davy Crockett Disney-produced television episodes and extrapolated by Bob Gurr and others into operable form for Disneyland, circled Tom Sawyer Island, a careful index of many places and incidents sometimes mentioned only in passing by Clemens in his famous book, passing along the way Wilson's Cave Inn, a factual figure and location along America's waterways, integrated into the Disneyland television show, and redesigned by Marc Davis for the Walt Disney World show. The ties become culture soup, unlikely and undesirable to untangle. In 1996 the Magic Kingdom Florida's remaining steamboat Richard F. Irvine was refurbished and renamed the Liberty Belle, in an effort to tie the boat more concretely to her dock in Liberty Square. Part of this effort included a new spiel, rewritten and revised perhaps more extensively than any other equivalent spiel at Walt Disney World. These spiels were often recorded by a jovial but generic sounding "captain" who would point out various attractions of interest along the ride path in typical "folksy" fashion. The new Liberty Belle spiel, adapted from the existing Keel Boat Standard Operating Guide Narration, split the role amongst two narrators, a "captain" and a "pilot", allowing for some degree of banter to enter the narration. The clever touch is that the pilot is Sam Clemens and the captain is a gentleman named Horace Bixby, putting the time frame of the attraction somewhere about 1857 - 1860. Instead of being the result of Clemens' fanciful adventure tales, Tom Sawyer Island is now the place which inspired them. There are a handful of objections to the spiel, including certain historical inaccuracies - Horace Bixby was never a riverboat captain to Clemens, for example, a Captain of a riverboat being the owner rather than chief operator of the vessel - and the generally pervasive sense that the existing spiel was peppered with passages from a rather short collection of famous Sam Clemens quotes in fairly desperate fashion. It is, however, the only attraction in Disney to casually mention almost hanging somebody as a throw-away joke, and deserves more credit than the above paragraph perhaps suggests. At this point we reach the For Further study portion of this history lesson, which is not, as expected, "The Adventures of Tom Sawyer" by Mark Twain but rather, his lesser known and wickedly entertaining "Old Times on the Mississippi". This series of seven articles is the absolute basis of the Liberty Belle spiel, and although nowhere in the work does Clemens once mention Horace Bixby by name, any cursory examination of Clemens' personal history will dredge this name up. It is the stuff of legend that Clemens was once a Riverboat pilot, and "Old Times on the Mississippi" proves the tall tales true with comic anecdotes, technical specifications, atmosphere and nostalgia. In the shadow of the book does the Liberty Belle spiel become a fount of rich history. One of the secondary functions of Disneyland and The Magic Kingdom is teaching; histories and architectural styles are taught with mere glances, while films, novels, plays, music and all other media are annotated vigorously and continually. Although probably not everyone was led from Mr. Toad's Wild Ride to The Adventures of Ichabod and Mr. Toad to Kenneth Grahame's beautiful The Wind in the Willows as I was, but youthful expeditions on Tom Sawyer Island at Walt Disney World may one day bear fruit as assigned readings of Mark Twain in high school become as nostalgic and enjoyable as hey deserve to be. It would probably be impossible to construct a full list of references for something like The Haunted Mansion or Pirates of the Caribbean, but memories of everyone from Charles Dickens to William Shakespeare to Oscar Wilde and Robert Louis Stevenson echo through Walt Disney World like a chorus. The full text of Old Times on the Mississippi. Further information on Clemens and Bixby. Full text of The Adventures of Tom Sawyer. Old Times on the Mississippi, 1876, Mark Twain - nonfiction. In the industry of theme entertainment, much has changed since the sophisticated Disneyland model entered the marketplace in 1955. Once, the roller coaster was a competitive market, but the tide has gradually turned away and coasters are becoming smaller draws year by year. Anybody who remembers when it seemed like “virtual reality” would soon dominate all creative, entertainment output will recognize the pattern, even more abbreviated. In truth, Disney designed rides have gone through so many “fads” that the origin of them today seems slightly obscured. It’s a fairly safe bet that, for example, most people under the age of 30 wouldn’t consider anything that doesn’t move in a linear direction on some kind of guidance system to be an “attraction”. And yet it is illuminating to consider that, in 1955, by far the bulk of the Disneyland attractions were “self guided” in nature, including most of Tomorrowland. In light of this - and the next 50 years of theme design – there is a compelling argument that the “Walking Attraction”, as much as the “Theatre Show”, “Dark Ride” or “Roller Coaster” is its’ own unique aesthetic mode of attraction, worthy of its’ own careful considerations. This is not to say that the self-guided attraction is actually thriving in today’s market; if it is built at all today it is likely to take the form of a queue experience funneling the spectators towards a motion based ride. This is a logical if unenviable fate for the original aesthetic mode of the themed experience; the spectator is waiting her turn in line anyway, and there might as well be a highly themed walkthrough attraction as a preface. This reaches its’ apotheosis at Disneyland’s Indiana Jones Adventure and Animal Kingdom’s Expedition Everest, where the queues are done with a great deal more care and detail than the rides themselves. Perhaps the inevitable decline of the number of Disney self guided attractions is an end result of the fact that it’s very hard to straddle a line between a museum (One Man’s Dream) or a corporate exhibit (Transcenter) to make a walk-thru feel like an organic creation. The original EPCOT pavilions were sometimes good and sometimes bad at this, but were usually done with a degree of aesthetic class and cleverness not often found in today’s Innoventions or Project Tomorrow displays. “Type A” of the self guided attraction may be regarded as the linear attraction, where the flow of peoples is projected in a linear fashion through a series of rooms or exhibits. This flow of peoples is essentially similar to the forward flow of vehicles on a track, where variances in speed and direction can slow down the entire chain. 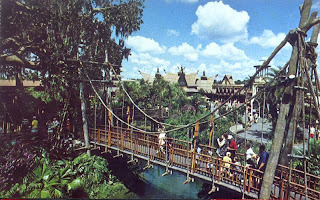 This is the mode which the indoor attractions would all eventually become based on, but an especially desirable example here is the Swiss Family Treehouse because it is not only a linear attraction, but one which is essentially an outgrowth of the Adventureland area itself. The Treehouse is a form of interactive public art, where spectators from the ground level can enjoy viewing the tree and spectators on the tree can enjoy viewing the ground. Both views are different but essentially analogous. The Treehouse is a pastoral which flatters both itself and the areas it views, especially at Walt Disney World where the Adventureland Veranda loop of facades were built to be viewed from on high. It has its visual interest but the primary focus is on the view and the privileges it presents. The Treehouse is also unique and interesting in that it is the most complete example of the “phantom population” – the debris and signifiers of a “local” population Disney goes to great lengths to suggest inhabit its’ parks, going about day to day business, which of course never exist. The Treehouse, remarkably, is an open house for a house literally inhabited by nobody, but the emptiness is never uncanny thanks to Buddy Baker’s “Swiss Polka”. For an attraction with only one moving part – the fascinating water wheel – it feels very little like a static tableau. This quality is thanks to the fact that the Swiss Family Treehouse is really part of Adventureland, and although is may be “gated”, the life it has is the life of Adventureland’s shops and attractions and walkways. It does not answer but it once again invokes the essential question of whether the themic unit of a Disneyland “-Land” is the original walking attraction. “Type B” of the self-guided attraction is best typified by Tom Sawyer Island, which is an area where the direction and speed of the experience is open, but the boundaries of the area are defined and controlled. Tom Sawyer Island, an area defined by a river with only one point of entrance and exit, is mythologized by its’ remote nature. But the Island recreates the mythical state of youth, and the big river and circling steamboat elevate the experience to a fully convincing illusion of the great outdoors, which is of course absurd because the entire island is manmade and crisscrossed with electrical lines and utilities. The free-roaming nature of the Tom Sawyer Island attraction goes a long way towards creating the illusion of a totally unrestricted environment in strong contrast to the single direction demanded by the Treehouse. The Island offers a degree of uncertainty, facilitated by the design of the cave walk-through attractions - the caves are large show buildings buried in dirt, and as such the Island is a mound of earth where one can never see the attraction’s other shore, creating surprise when one comes across the old mill, or the entrance to another cave. Those caves, in particular - self-contained Type A walking sub-attractions placed in a Type B environment - are the dark heart of Tom Sawyer Island, it’s true reason for existence. Nowhere else in Disney attractions is the illusion of being in a truly unrestricted environment where things could genuinely go wrong played out so carefully and effectively, the true Haunted Mansions where all bets seem to be off. The “adult” characters on the island – blacksmiths and a fort guard at Walt Disney World, General Jackson at Disneyland – are distracted or rendered harmless, furthering the illusion of free reign in what is actually a very controlled sector. In Type B attractions, Tom Sawyer Island especially, the designers stress choice over a linear path. What defines it is the controlled entrance and exit, the turnstile or the ticket booth. This pattern, of course, is the pattern which the Disney parks emulate – one is presented with labeled choices through which one may wander. The illusion, however, on Tom Sawyer Island (where the area behind Fort Wilderness seems to go off into “nature”) as everywhere at Walt Disney World, strives to be a "Type C" attraction – all possible choices and all possible directions. Type C attractions most often function as exhibit halls, the Halls of Chemistry of Disney history. As such they tend to be small pockets set down inside the larger park, unguarded and unticketed, and most resembled those dreaded arcades, museums and corporate exhibits Disney’s team of designers often seek to differentiate themselves from. The earliest in Disneyland history – the Penny Arcade – begat increasingly complex versions, and the mode of Type C self guided attraction which has most repeated itself arrived with the 1967 New Tomorrowland, with its’ Bell Telephone preshow to the Circle-Vision America the Beautiful film, and especially the Monsanto exhibits at the exit of the Adventure Through Inner Space, an area with a fashionable 1967 look and feel quite removed from the Claude Coats stark dark ride which ostensibly prefaced it. The most exhaustive use of the Type C walk-thru attraction occurred in 1982 at EPCOT Center, where nearly every Future World pavilion had an adjoining exhibit at its’ exit as well as a sponsored space in Communicore. 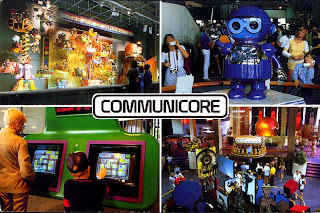 The most influential may have been Image Works, a free-flowing digital playground which was the template for many a children’s science museum nationwide, but the most complete and complex execution of a Type C attraction was and is Communicore, which has a poorer modern-day equivalent in Innoventions. Communicore represents the total integration of varying types of attractions within a unitary whole because each self-guided attraction was an extension of the traditional attractions ringing it. EPCOT Center‘s didactic messages and inspired executions took form in a variety of concept exhibits and interactive pieces working overtime to validate the park’s humanist aims. The triumph of Communicore lay not in the content, but the concept – whereas previously different attractions existed throughout a Disneyland-type park sharing only an apparently linked physical or narrative similarity, Communicore posited a theme park where all types of attractions can be united under a conceptual or intellectual common element. One doesn’t need to see the Swiss Family Treehouse, for example, to understand aspects of the Jungle Cruise, but a trip through the Universe of Energy in 1982 was greatly expanded by Communicore’s Exxon Energy Exchange. This minor facet is just one example of EPCOT Center’s explosion of aesthetic norms in themed design, the most important innovation in the field in the last quarter of the 20th century. Ironically as the number of self-guided exploratory type attractions has dwindled, the definitions and rules governing such non-traditional attractions has exploded open. Under the A – E ticket system Disney defined anything requiring a ticket to be an attraction. With the disbanding of this system in 1983 (following, ironically, the walking attraction’s greatest achievements), many different areas can now sport the title “Attraction”, such as Walt Disney World’s minor Fantasyland Pooh playground, or EPCOT Center’s loud but benevolent Club Cool. And yet the variety of things available at Disneyland and Walt Disney World has been slowly shrinking, as each Stateside attraction moves towards being a water-sprizting scent-wafting 4-D roller coaster with each passing year. As such, the state of the self-guided attraction is in a state of flux, as those low-tech Type A and B attractions not already endangered are becoming increasingly rare. Yet if Imagineers are disinterested in considering the self-guided tour as a viable mode of entertainment, a hybrid attraction of the past may be worth considering for the future: the 1975 Space Mountain, where the queue and post-show were self-contained Type A attractions – past displays of RCA products. The ultimate problem with trying to classify the successes or failures of a walk-through attraction at Disney is that, on a certain level, everything begins to resemble one. Particularly with Disney’s constant attention to detail does something like Main Street, USA begin to appear to be an attraction, or perhaps Disneyland’s Riverfront. It’s hard to draw an exact boundary between attractions and non-attractions in Disney theme design, and even the rule that an attraction is something guarded by a turnstile cannot hold because Disneyland herself is bermed in in all directions and gated. In the days of the individual attraction tickets one could buy herself a ticket only good for admission. Although this functioned as a extension of Disney’s old policy that tickets never expire, it also functioned as an economical solution for those only in seek of all the myriad rewards Disneyland offered that weren’t inside, in the dark.